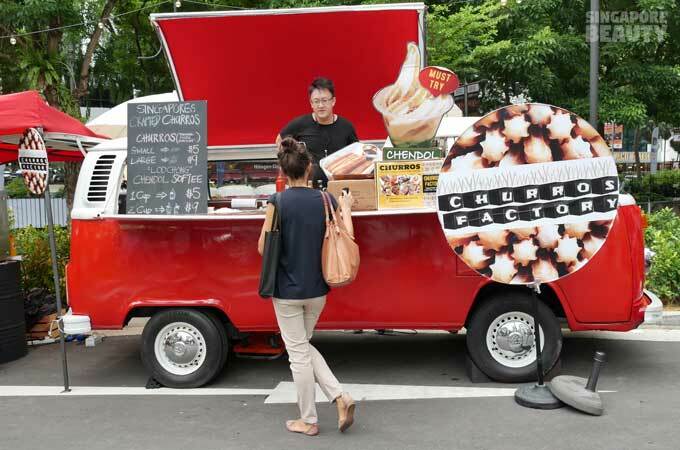 All Thai culture and foodie fans, please gather now! 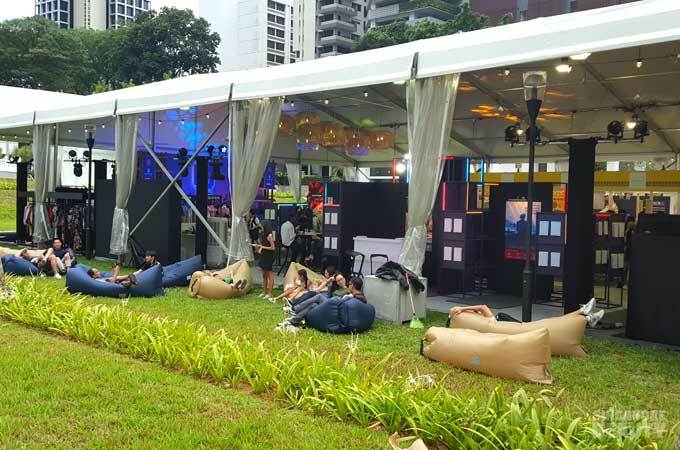 The Finest Thai 2017 is happening from now till Sunday at Royal Thai Embassy in Orchard Road. Admission is FREE. 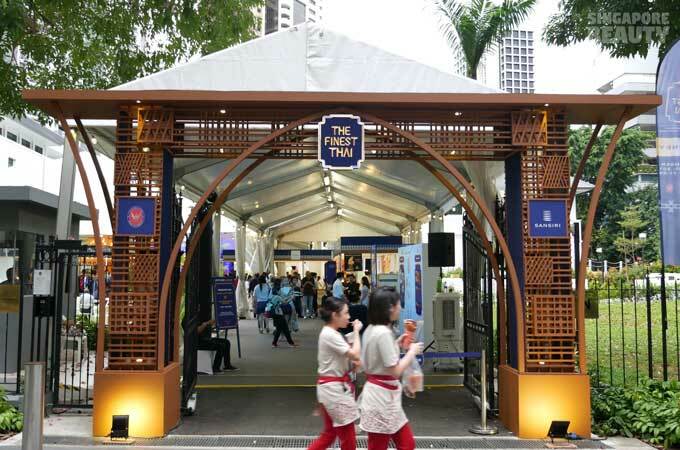 Entrance is designed as an exquisite wickerwork archway to welcome the visitors to this event. 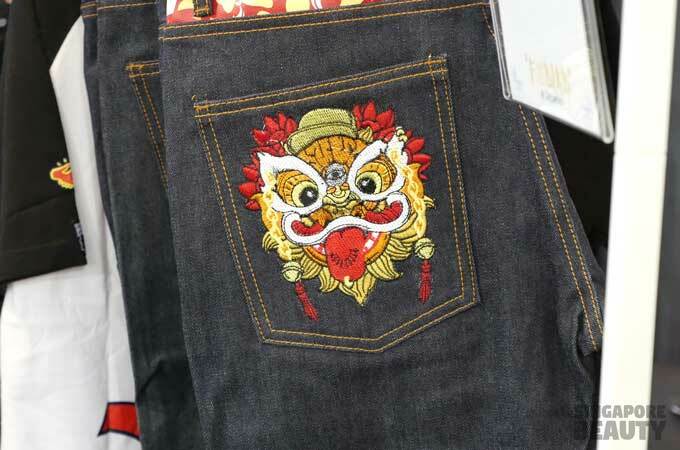 This is held to celebrate Thai’s wisdom in food, craftsmanship and their cheerfulness. Near the entrance, find a handy directory to navigate the festival grounds and the highlights of this event. 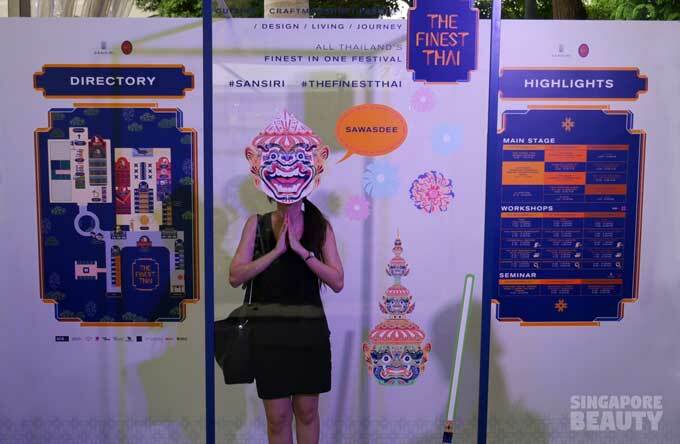 Snap a picture at the photo wall and hashtags #SANSIRI and #THEFINESTTHAI. 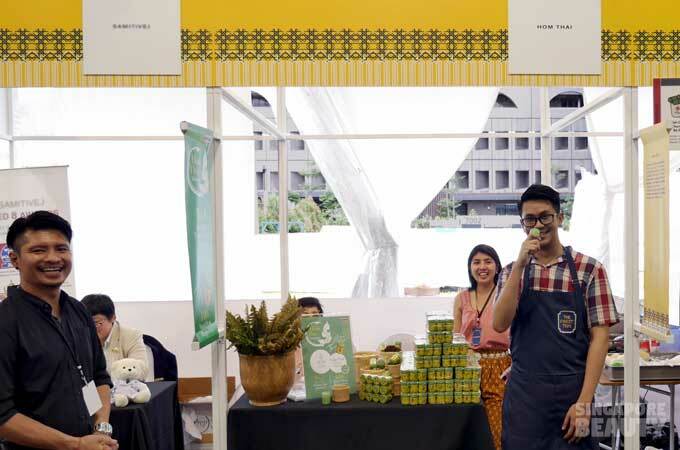 Share this so that your friends can get to experience Thai’s culinary, handicrafts, fashion, design and lifestyle. I shall crown them with the best value for drink-thick milk tea and best value for money. This is a MUST-buy drink. 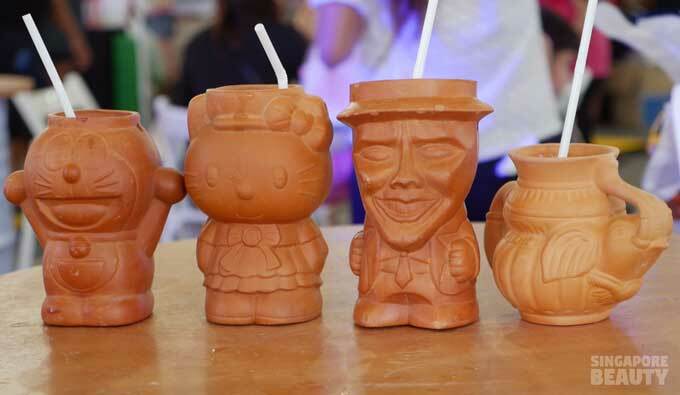 Buy their Chayen (Thai milk tea or Thai green milk tea) and take home a clay mug, all for only $4 each. Comes in at least 4 designs, while stocks last. This is a steal! Do remember to try their rainbow mango sticky rice ($6) in flavours of blue pea, carrot and pandan topped with slices of sweet juicy mango. Also popular ($4 each) are Ck wings, fish cakes and spring rolls. 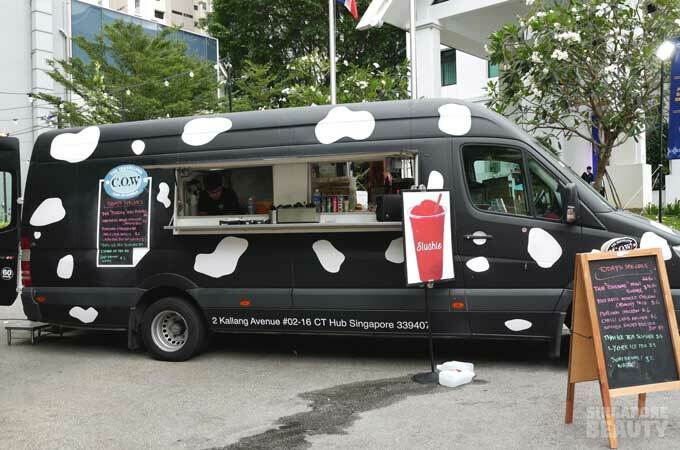 After You Dessert Café’s first time in Singapore, come and experience their top three best sellers. 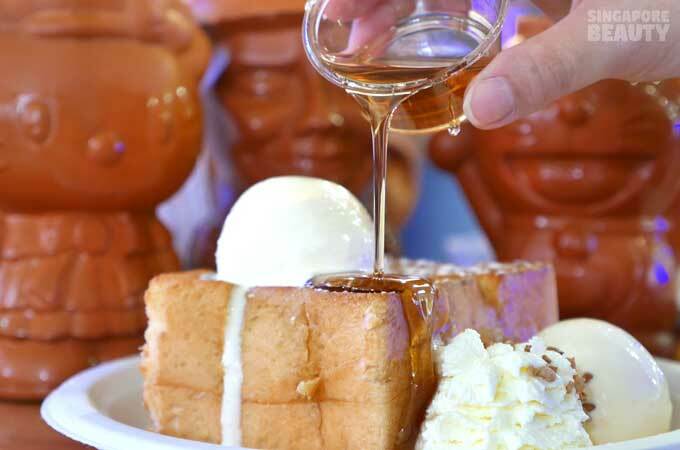 Shibuya Honey Toast($15), comes with thick sponge toast, 2 scoop of ice cream and a drizzle of honey. 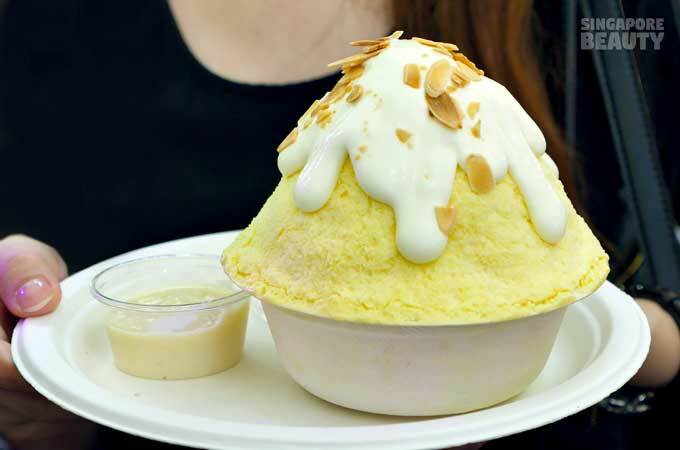 Kakigori ($20) is the famous shaved ice dessert in Thailand. 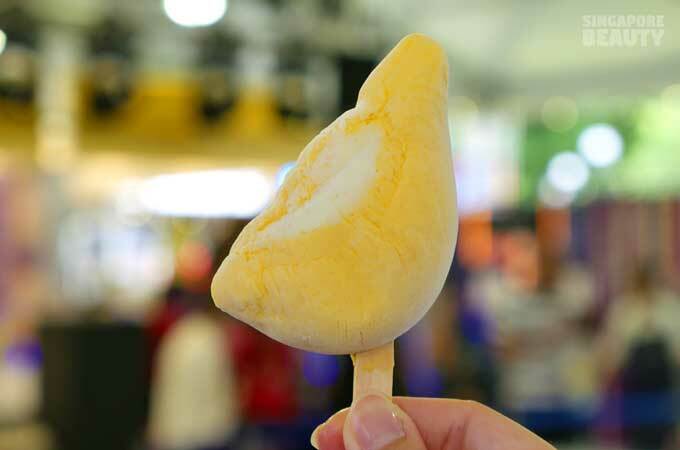 Choose from 2 flavours Thai Tea or Durian sticky rice. The Durian Crumbstick ($6). 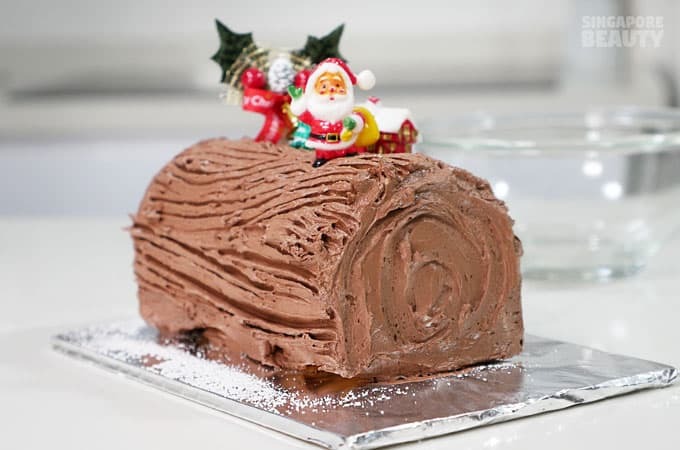 You can save this as the last on your to-eat-list at this event, quoting them “There’s always room for dessert”. Be warned, the queue might stretch up to a 30 minutes wait, do get some other nibbles to chew on while waiting. 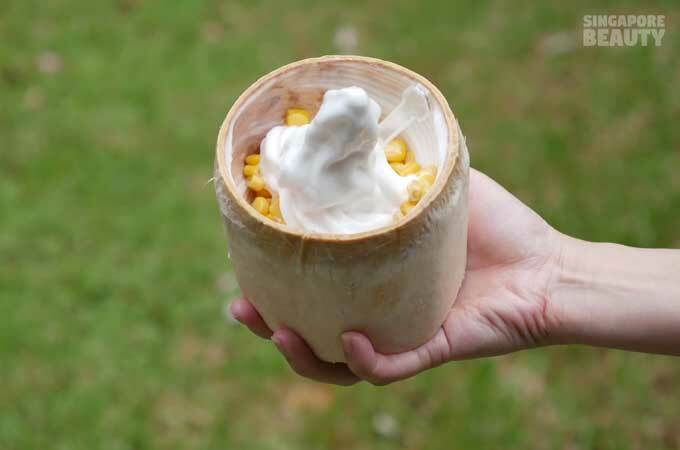 Try their dairy free coconut soft serve ($7) in a coconut shell. 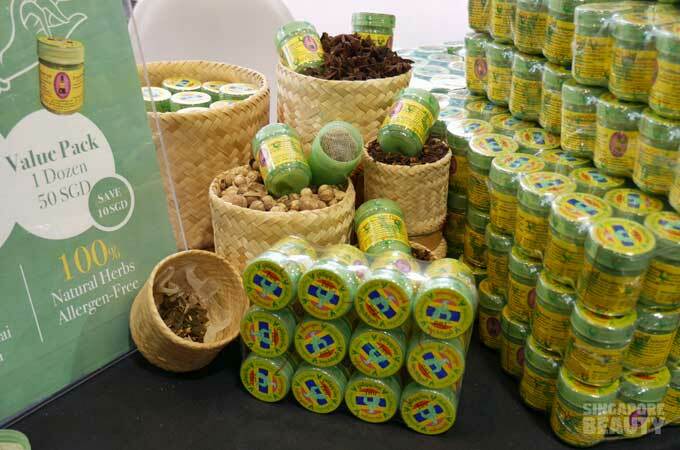 Made from 100% Thai coconuts with a good dose of sweet corns and a sprinkle of nuts. 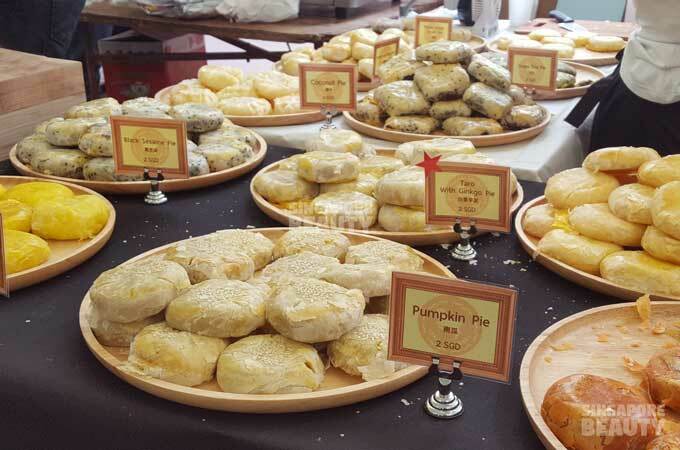 Freshly baked pie ($2) comes in Thai milk tea, taro ginkgo pie, pumpkin pie, black sesame, custard coconut, green tea and many other flavours. These pies use only premium ingredients, no preservatives, milk or butter. You will love them for their flaky skin and generous fillings. Try their Thai braised pork knuckle rice ($9). 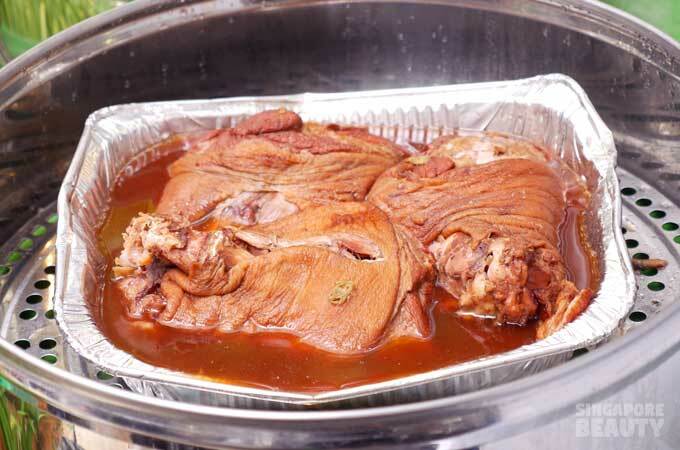 Well marinated, tender meat and skin that melts in your mouth. 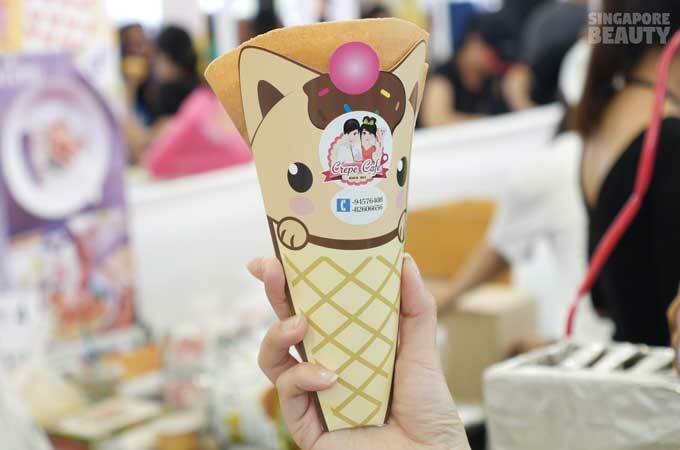 Thai crepes (from $4) –piping hot and crispy, just select your favourite toppings. 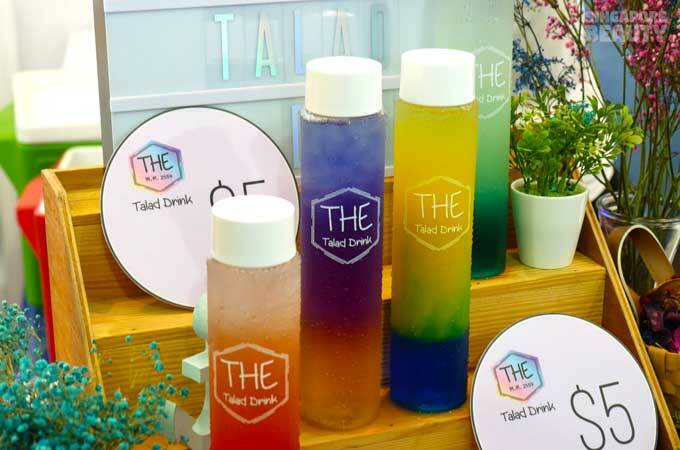 Try their An Chan Peach($5)- a concoction of peach with butterfly pea tea. Very instagrammable. Try their original Churros ($5). Try the Thai Basil minced chicken crunchy taco ($6). 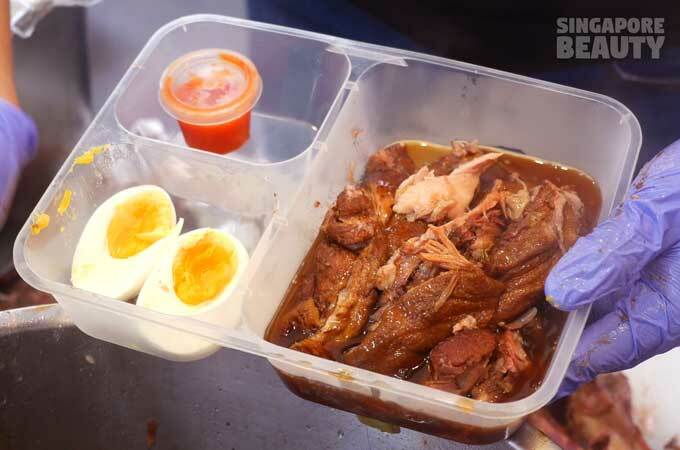 After pigging out on the authentic bites from Thailand, time to embark on the must-do-list. 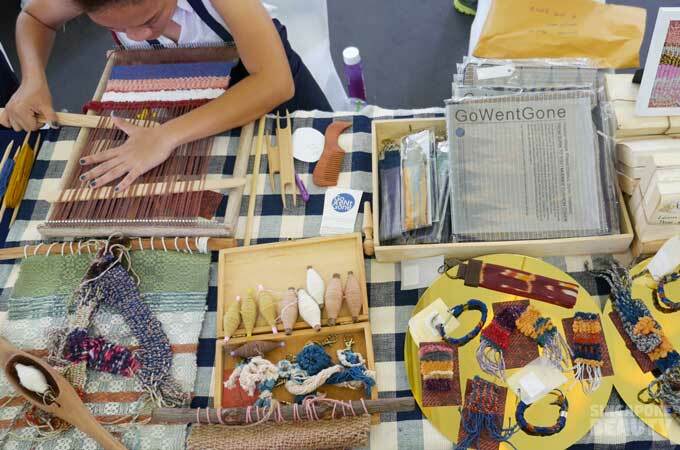 At the Thai handicraft workshop, try your hands on Thai silk weaving (starts from $10). You can weave a unique hand band or even a cushion cover to bring home. Immerse yourselves in the classic Thai dance or chill out at the Singha Beer station with the Bangkok Molam International Band. 3 bottles for $18! 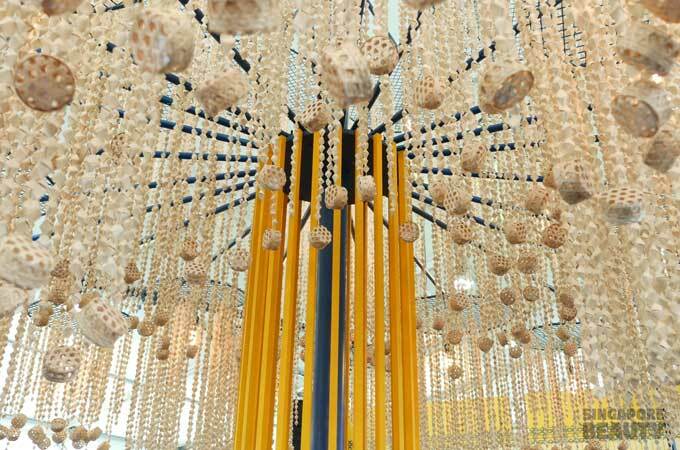 The Soi-Dao Tree is a stunning display of Thai’s excellence in craftsmanship. 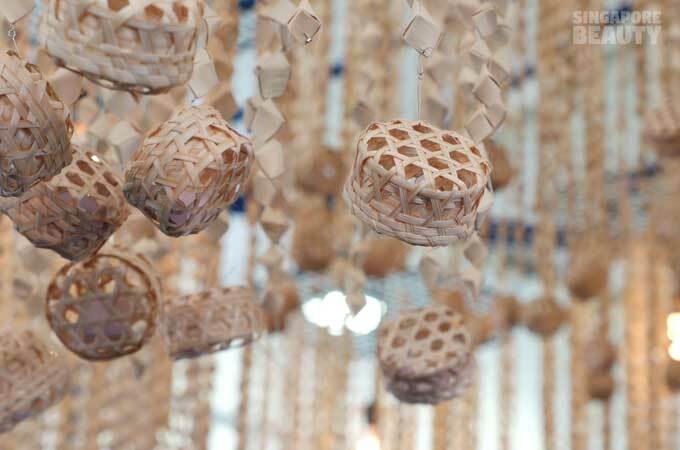 Bedazzled by the assemblage of over 10,000 Pak-Paos (Thai antique toys of leaf-plaited fishes, woven balls, baskets) threaded into a tree of overhanging garlands. A classic lucky draw game adored in Thailand. 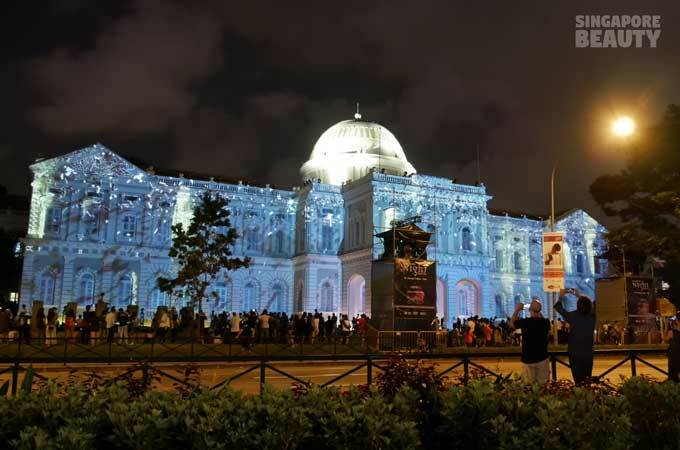 It holds the top prize of three Singapore-Thailand return tickets by THAI Airways. Register for this draw at the Sansiri family booth and pick a woven basket that holds a prize in it. This is a sure-win lucky draw tree so wait no more. A multi-designer house that brings 300 fresh online brands to you. Find that unique piece of apparel that is always missing from your wardrobe here. Check out the aromatic reeds diffusers. 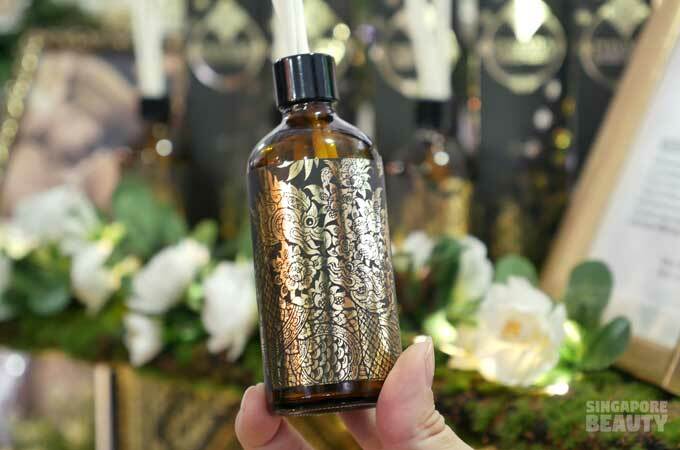 The all natural traditional Thai herbal inhalant ($5) using 15 types of real dry herbs in the bottle. Very refreshing and good for stuffy nose. 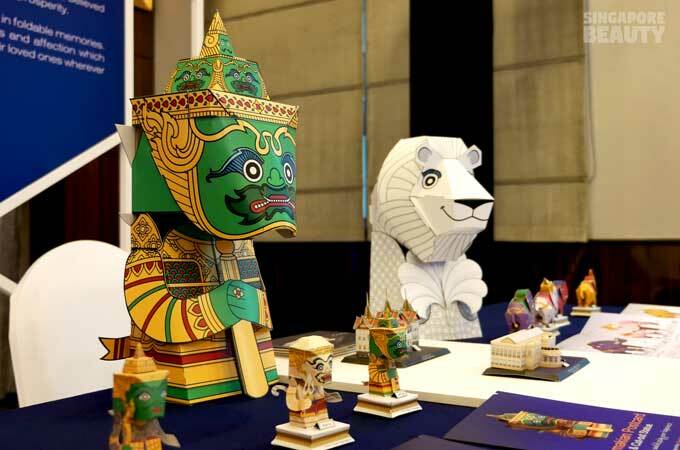 Create your own pop up statue, animals and buildings from paper cut-out. 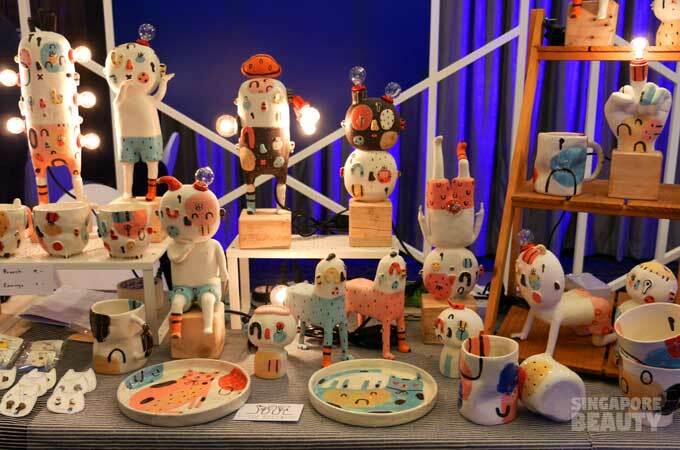 These are handmade ceramics. 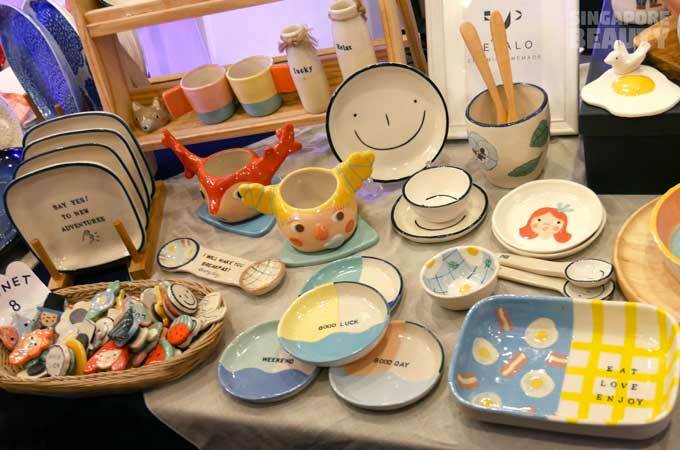 They carry a range of creative dishware from soup spoon, saucer and even ceramic brooch. Do check them out! Mr. Athit Mingchua adopts a style of abstraction to blend patchwork and artwork. A stoneware creation that is both functional and aesthetically pleasing with a whimsical touch to every piece. Tired and need a place to rest your weary feet? Or need a table to nom? Fret not, there are plenty of place to sit or crouch. Alfresco picnic tables, indoor long tables, standing bar, lazy bags or just sit on the beautiful lawn, the weather is exceptionally kind and good today. 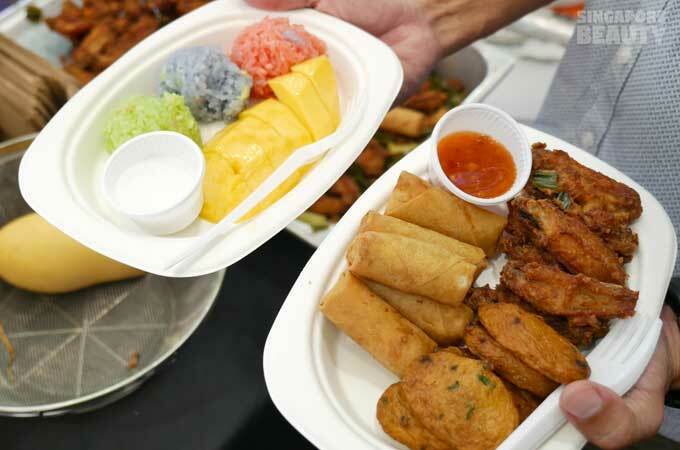 Hurry down to THE FINEST THAI today before it is gone again. 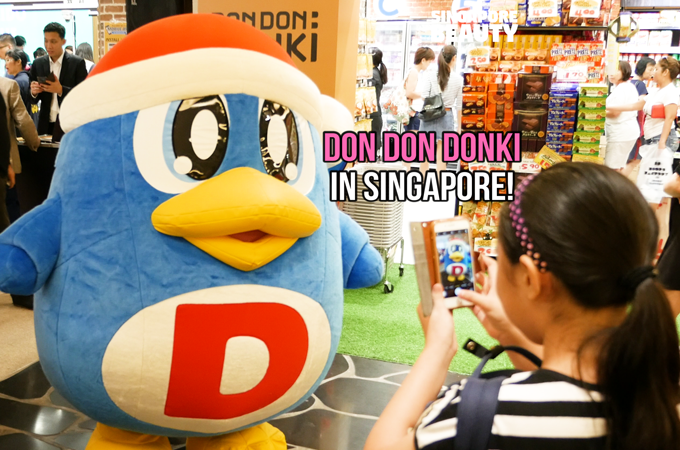 8-10 September 2017, 12 PM – 9 PM.